The Epic Pure Water Filter is not only Epic, but revolutionary. From waterborne pathogens, to heavy metals, fluoride and even trace pharmaceuticals, all are eliminated so that you can rest assured that the only thing that reaches your body is the purest water. Our filter technology has been tested around the globe to ensure that you can count on it to filter out the toxins that come from the tap. Designed to remove up to 99.99% of all contaminants, the Epic Pure Water Pitcher Filter is the most sensible choice in tap water purification. All filters are replaceable and independently tested by 3rd party labs against EPA/ANSI Standards 42 and 53 for contaminant reduction. With each filter capable of purifying 946 Litres of water, the Epic Nano Filter is also a great economical choice. ★ AMERICAN MADE 5-STAGE TRIPLE CAPACITY FILTERS: Each premium quality filter produces 200 gallons of fresh, contaminant-free drinking water (lasting four times longer than any Brita pitcher. Removes 99.99% of all tap water contaminants. Replaceable filters are 100% BPA-free, 100% FDA-approved food grade materials, 100% recyclable, 100% vegan. ★ RIGOROUS TESTING: Filters tested extensively in USA including Los Angeles County, as well as heavily contaminated homes in Flint, Michigan. Independent lab results show our filters to have removed lead, copper, and many other metals and toxins to undetectable levels in Flint. (Now that's Epic). Testing also conducted by independent labs in 16 countries inc: UK, Japan, Australia, Brazil, New Zealand. ★ THE FACTS: Our eco-friendly filter media remove 2000% more contaminants than Brita (yes, two-thousand percent) including Lead, Chromium 6, Fluoride, Chloramines, Mercury and much more. Five-stage filter (2 micron pores) including lead and fluoride filters, protect you and your family from contaminants that other filters miss. Smart filter media keeps healthy trace minerals like calcium and magnesium in your water, which ZeroWater, Pur and reverse osmosis systems strip out. ★ RECOMMENDED REPLACEMENT: Once per 4 months based on average daily usage and tap water quality. 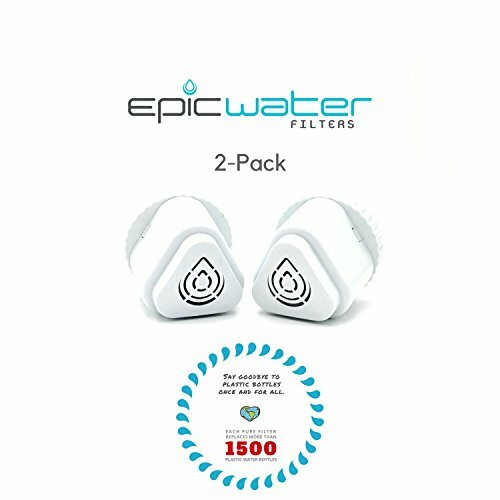 If you have any questions about this product by Epic Water Filters, contact us by completing and submitting the form below. If you are looking for a specif part number, please include it with your message.